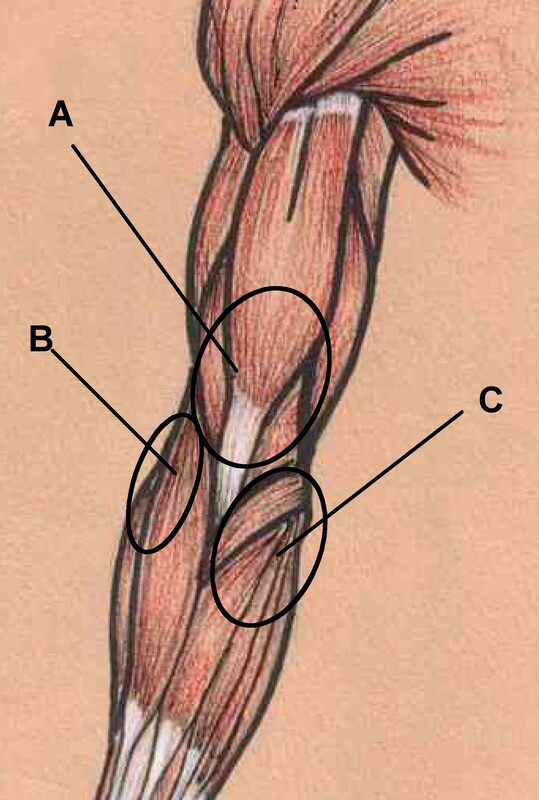 And the pain is located in: Area “B.” Yesterday’ Legs & Back routine gave me the chance to attempt pull ups once again and the source of the pain was evident: the brachioradialis muscle, shown as “B” in the picture to the left. The pain manifested itself in an assertive way during Wide Front and Closed Grip Pull Ups. So, I decided to strategically reduce my pull up reps for the first time since beginning P90X earlier this year. I had no choice, really. While I was able to match or slightly better my performance with Chin Ups and Switch Grip Pull Ups, pushing myself on the wide and closed grip would’ve definitely resulted in prolonged unhappiness. Because of this strategic reduction, my cumulative, unassisted pull ups dropped to 116, down from last week’s all time high of 136. This sets me back to where I was somewhere between weeks 1 & 2 of this round. But it’s better than the alternative, which I hope to avoid: no pull ups or in and out bicep curls for a few weeks or so. I may even opt for bands on the in and out curls as a therapeutic approach. I know this is the right thing to do. But, to be honest, reducing reps made it much tougher to mentally slough through the Legs & Back routine. My “reward” for my efforts up until now has been the gains I consistently experienced from week to week. I will need to recalibrate my mind to focus on some other incentive, such as maintaining my ability to unscrew a cork from a bottle of wine–a critical life skill. Because I was all depressed about my strategic reduction thing, I ripped off my HRM just as I finished Legs & Back, even before the cool down stretch. So my stats below do not include the final couple of minutes of Legs & Back and also didn’t record Ab Ripper X, which I almost skipped. But something made me do it. I’m glad now that I did. It would have been too easy not to yesterday. On a positive note, I knew going in to yesterday’s routine that pull ups had to decrease. I just wasn’t sure which and by how much. So I increased my weight to 2, 45 lb dumbbells for the calf raise squats. I had been at 40’s for quite a while and this was a chance to pick it up a bit. Also, staying positive, the brachioradialis pain does not appear when playing tennis so I continue to swing away. This entry was posted in P90X-Insanity Hybrid, Round 3 and tagged Ab Ripper X, brachioradialis, Calories, Heart Rate, Legs & Back, P90X-Insanity Hybrid, Pain, Pull Ups. Bookmark the permalink.